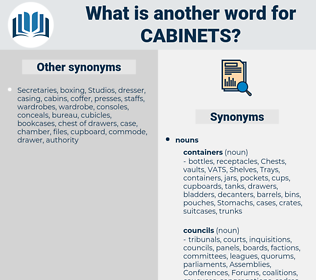 What is another word for cabinets? 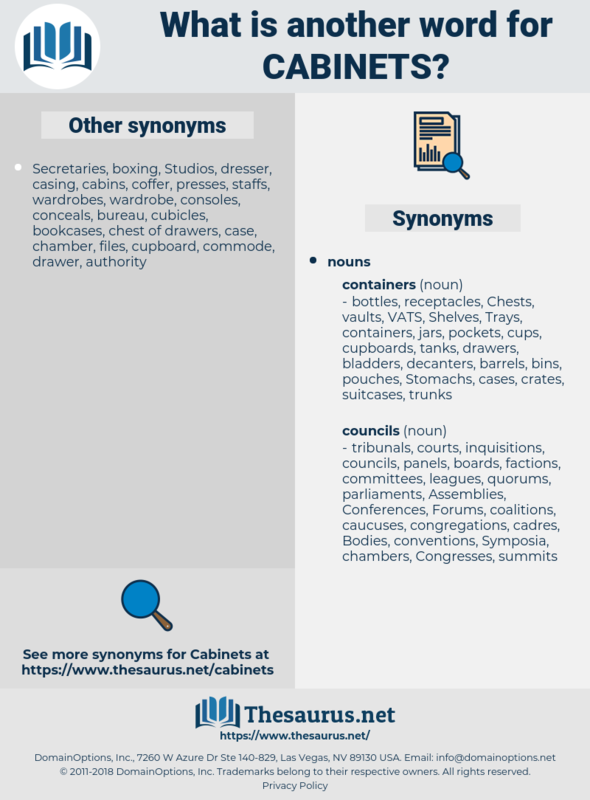 secretariats, cabs, accommodations, caskets, enceintes, corporations, gouvernements, jurisdictions, interpreters, ggovernments, Casings, increments, containers, quarters, boards, tiers, contractors, Pregnancies, cages, settings, precincts, practices, graduations, speakers, cubicles, Infants, echelons, fittings, Telephones, payphones, stalls, sets, premises, reserves, meubles, chattels, circles, Chests, Companies, graders, Arenas, rooms, contexts, ranks, files, Carcasses, grades, lockers, clinics, levels, folders, Cargoes, Movables, trucks, Scales, booths, Bodies, bezels, Firms, phones, surgeries, layers, Boxes, vessels, placards, workbooks, shops, doors, kiosks, bunks, venues, kits, surrounds, skins, Armories, rungs, jumps, complements, chambers. pregnant, binders, Fora, office, offices, enclosure, enclosures. cabins, councils, closets, reservoirs, furnishings, cupboards, tanks, chillers, counters, ranger, frames, Forums, compounds, binders, Fora, offices, enclosures. Then there was a friend of many years' standing, a Minister in successive Cabinets, who feigned that by remaining in office he would be able to favour the cause, and who, instead of that, did his utmost against it. Lord Castlereagh, who had been less accustomed to command, and had less difficulty in stooping to conquer, succeeded better with his English friends, and in a few years he ruled the cabinets of Europe; while the Iron Duke, another Irishman, dictated to their armies.